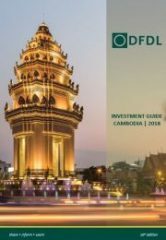 It is our great pleasure to introduce the 2018 edition of our Investment Guide for Cambodia. In this guide we aim to help investors from across the globe in reaping the vast benefits of doing business in Cambodia, and making the most of the vast opportunities the country offers, with its welcoming, entrepreneurial, and highly motivated people. Our role is not merely to advise on projects and transactions, but also to serve as a vital conduit between the economic and business practices of the developed modern world and those of a country determinedly striving towards a better and more prosperous future. We aim to assist and empower you, the prospective investor, in maximizing the untold opportunities that await in Cambodia, while ensuring that you establish lasting cultural and commercial ties with your local counterparts in both the private and public sectors.